The devil comes in many forms; at Lee's Palace, he came as Manuel Gagneux of the Swiss band Zeal and Ardor. This is actually less hyperbolic then it sounds — between spasms, sweat and furious guitar bashing, Gagneux looked like a man whose soul was burning up inside him. At their first-ever Canadian show, Zeal and Ardor confirmed they're one of the most exciting acts in the metal scene. Astronoid brought a post-everything vibe to start the show, with a triple guitar attack and pre-recorded vocal effects. Heavily indebted to Deafheaven and Explosions In the Sky, the Bostonians kicked up a solid wall of sound. Beautiful and cathartic, they brought on all the feelings of standing underneath a summer cloudburst. Most bands would find this very difficult to follow. Fortunately, Zeal and Ardor are not most bands. Their blend of black metal and traditional African-American spirituals is entirely unique, but also readily accessible. As their sinister mantra of "burn the young boy, burn him good" began, it became clear that this would be unlike anything else to ever grace the Lee's Palace stage. The coup-de-grace was the two backup singers at Gagneux's sides, without whom the show would not have been complete. The ease with which Zeal and Ardor melded their two main styles was a sight to behold. "Come on Down" became an early highlight, while "Row Row" turned the crowd into some sort of deviant gospel congregation, all hand-claps and wild yelling. "Ship on Fire" proceeded with all the grim feeling of a death march, and Gagneux's eyes bulged and threatened to pop out of his head. Once "Blood In the River" crashed and shuddered to a close, everyone looked exhausted. And we weren't even a third of the way through. What sold Zeal and Ardor was their complete lack of theatricality. There's no face-paint, no studs and leather, and no overt symbols of satanic intent. Gagneux was dressed in a simple black hoodie and jeans, and rarely said a word aside from singing. Somehow, this made his performance even more terrifying. 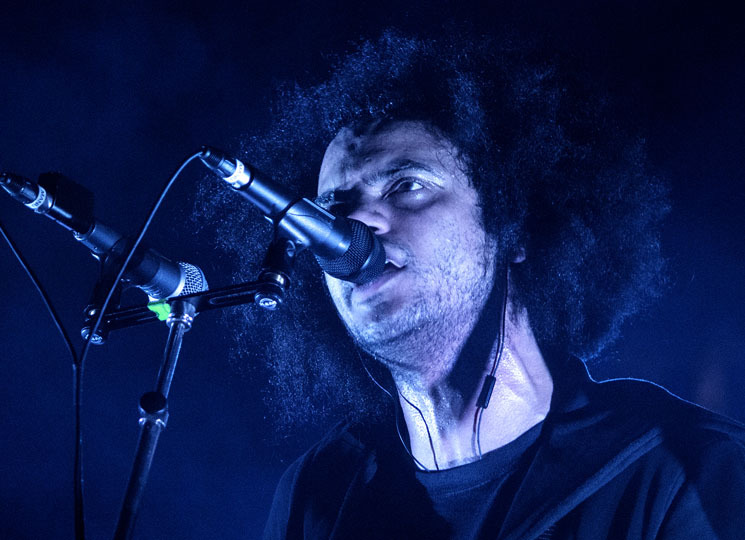 Based on his voice and musical presence alone, Zeal and Ardor managed to outdo any band in the current black metal scene. Many crossover acts in the Zeal and Ardor vein become boring quickly. Z&A mix it up by including breakneck shredding, eerie soundscapes and a honky-tonk piano solo during "Gravedigger's Chant." It doesn't look easy, as Gagneux jumps between demented shrieking and Prince-like crooning, often within seconds. This type of unpredictability kept the audience guessing what could come next. Calling Zeal and Ardor the future of black metal would be a mistake. They're fresh, young, startlingly original and above all interesting. They've taken an established idea and turned it inside out to make a new one.